Hi, friends we know very well at present time billion of users watch different kind of videos on the YouTube. Most of the persons also upload his interesting videos on his YouTube channel for the public internet. 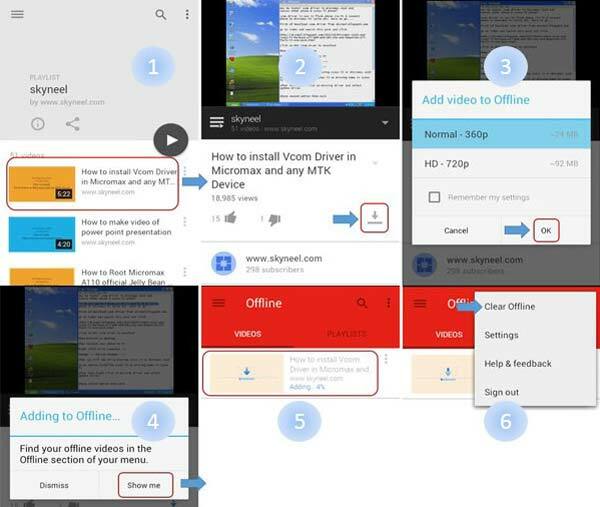 We must watch any video when you are properly connected with internet on YouTube but now, there is a great news for all YouTube users, Google provides a great feature “watch video offline”. By this feature there will be no need of YouTube video down-loader app for watch video offline on Android and iOS (iPhone). This facility enable you to download YouTube videos on your iOS (iPhone) and Android devices using Google YouTube app and watch downloaded videos any time. YouTube offline feature is available only for iPhone and Android devices. It is a very easy process and you can see “How to download a video on YouTube app by few easy steps”. Step 2: You will get a popup tab for go to offline section, So tap on Show me button. Now you will see your video is downloading (see in image 5). After download, you can watch this video any time offline. if your want to delete your offline video then tap on setting icon and choose clear offline option. The offline feature is available on lots of video for download, but not every video on the YouTube app. Mostly Music and Movies videos are disabled for offline (download). It can be watched only on YouTube app because these YouTube video saves in the .exo extinction and this format not supported by video player apps. I hope you like this article and also able to watch any required YouTube video offline. Kindly share your knowledge and this article with others to help them and also give any kind of suggestion regarding this article in the comment box. Thanks to all.